The production of blood cells is regulated by so-called hematopoietic stem cells (HSCs), which reside in bone marrow. It is known that under certain stress conditions, such as aging or inflammation, the HSCs' self-renewal capacity—a key property of stem cells—decreases. Now, a team of researchers led by Yuko Tadokoro and Atsushi Hirao from Kanazawa University have studied the role played by a molecule called Spred1 in the homeostasis (equilibrated self-renewal) of HSCs. 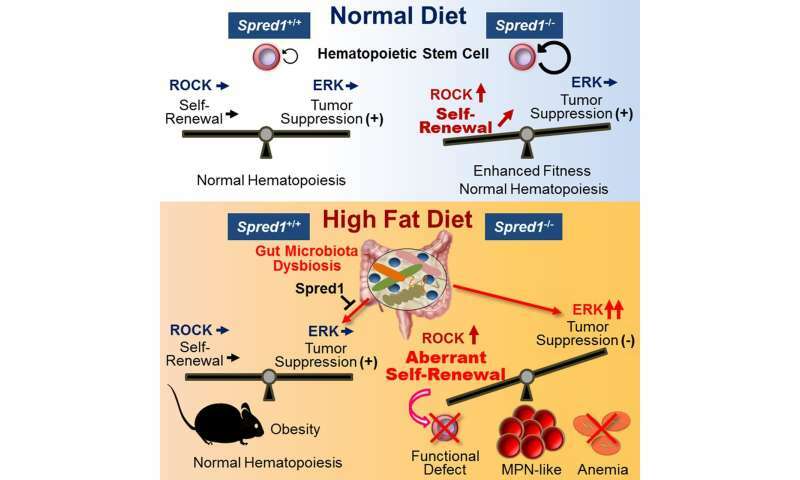 Their main finding is that Spred1 safeguards HSC homeostasis in mice subjected to a high-fat diet.